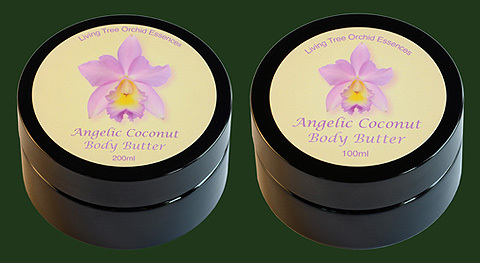 Angelic Coconut Body Butter is a body butter with Angelic Canopy essence added. The complete list of physical ingredients are as follows: Spring water, Jojoba oil, Almond oil, organic safflower oil, emulsifying wax, preservative ‘K’, wheat-free and GM free Vitamin E oil, vegetable glycerine, organic cocos nucifera extract, etheric infusion of LC Angel Love (Angelic Canopy). 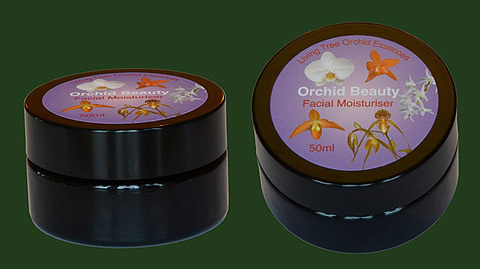 This facial moisturiser has the following physical ingredients: Spring water, Apricot oil, Borage oil, emulsifier, Shea butter, Avocado oil, preservative ‘K’, glycerine, Vitamin A, a hint of carotene, and wheat-free & GM-free Vitamin E.
The Orchid Beauty Facial Moisturiser has the following orchid essences: Rising to the Call of Beauty and White Beauty. 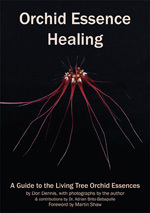 There is also Clearing the Way / Self Belief, to help one bring a quietly confident face to the world. And we have added Just Me, and Purity of Soul. It comes in a 50 ml Miron (dark violet glass) jar. There are 10 drops of mother tincture of each of these 5 orchid essences in every litre of the cream. These cream formulations have been developed locally by a small local business called Gigha's Natural Skincare, who have worked with us in refining the precise ingredients and the specification of the two formulae. As Morven is mixing the batch, she gives us a call, and I go one mile down the road here to add the drops of the different mother tinctures to the batch while it is cooling; and then Morven pours the finished cream into the jars. 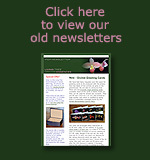 We are supporting a good local business. This is all the more important with our island location, where work is sometimes scarce. Helping the local economy to grow is a valuable process on Gigha. We cut down the transport and thereby the carbon costs. We are able to keep a close eye on the production process. By adding the drops of mother tincture at the very final stage, we ensure maximum potency of the essences is maintained. Batches are in small runs, which will also ensure that our customers get the creams with Best Before dates that are as long as possible. The creams have two years of shelf life at the time of production.